Paint a smile on the faces of the closest people in your life by sending this Eye-catching Bathroom Set with Mickey Mouse Design that carries the essence of the feelings for them straight from your heart. This Bathroom Set is arranged with One Toothbrush Holder, One Soap Pump and One Tumbler. Capacity of Soap Pump is 340 ml. 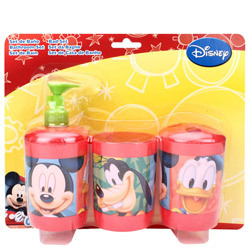 This Bathroom Set is made of Durable BPA Free Material and this Product is Easy to Use and Store and looks fabulous with Mickey Mouse and Friends Imprint.